Drake’s tattoo collection is a regular family reunion and the singer finally chose to add his father to the mix this week, opting for a weird tattoo of his dad’s mug shot, of all things. Unlike the family portrait tattoo on Drake’s back – which features large detailed images of the pop star’s smiling grandmother, uncle, mother, and, oddly enough, the late singer Aaliyah – Drake’s tattoo of his father is miniature-sized and done in black and white on the back of his upper right arm. While Drake commissioned celebrity tattoo artist Nikko Hurtado to ink the incredible family portrait tattoo on his back, it was Dr. 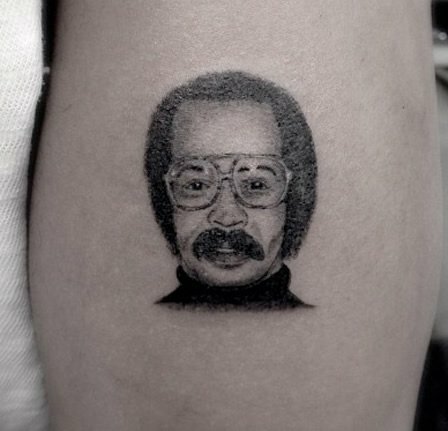 Woo of the Shamrock Social Club who inked the mug shot tattoo of Drake’s father, which we can’t help but think is a tad bit disturbing. 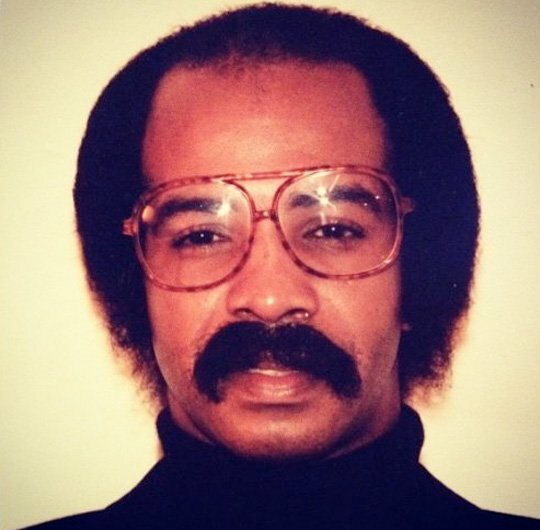 We know that Drake has had a strained relationship with his father, Dennis Graham, for much of his life. This is due in large part to the fact that Drake’s parents divorced when he was just five years old and his mother, Sandi, pretty much raised Drake on her own while his father spent time in prison on at least two occasions. The two have since made peace with one another, and seem to have a strong father-son bond now, but the fact that Drake chose his father’s mug shot for the portrait tattoo speaks volumes. Instead of portraying his father in the loving, happy way he did his other family members, Drake’s mug shot tattoo will forever remind him of one of the darker times in his father’s life. Rumors about a new Drake tattoo started flying earlier this week, when Rihanna and Drake skipped the Grammy Awards Sunday night and were spotted partying it up together that evening at 1 Oak, a popular club in West Hollywood. According to reports, Drake had met up with rumored-girlfriend RiRi at the club Saturday night as well, after making a detour to Mark Mahoney’s Shamrock Social Club tattoo shop and getting some new ink. Since then, we’ve been on the edge of our seats, waiting to hear about Drake’s new tat, which comes more than two months after his Houston star shoulder tattoo. Now that we’ve seen Drake’s tattoo of his father’s mug shot, we have to admit, we’re wondering what in the world he was thinking!